A couple of weeks ago I attended the 2009 Desiring God Pastors Conference. The theme this year was Commending Christ: The Pastor, the Church, and the Perishing. The keynote speaker was Mark Dever. Dever's messages were very encouraging, especially the final two, in which he shared so many stories about his own evangelistic efforts. A group of four men from our church came with me. One of the highlights of the conference was discussing with them practical ways that we could improve in evangelism at FPBC. One of my requests to them was that they help me connect with unbelievers. One of the guys has already acted on this. Saturday we spent a couple of hours visiting with two unbelievers. 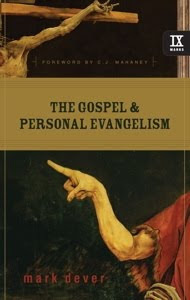 At the conference, I received a free copy of Dever's book The Gospel and Personal Evangelism. I already own a copy, so I'm passing it on to one of you. All you have to do to sign up is leave a comment about your own personal evangelism. If you're not sure what to write, start with one of these questions. Is sharing the gospel easy or difficult for you? Why? What is your usual approach? If asked to share the gospel in 60 seconds or less, what would you say? What would you like to see change in your efforts to share the gospel with others? How do you think believers with differing gifts could help one another in doing evangelism? I'll leave the drawing open until the middle of March. BTW, You can watch or listen to all the audio for free at Desiring God's website. Here are the links. I've already got the book. I had an interesting experience a few years ago meeting with my agnostic brother-in-law. I attempted to get the entire gospel message into our brief dinner together. This did not go over well and was a great learning lesson for me. I don't need to worry about getting the entire message in, but I can plant seeds of God's Word and life changing truths. Some plant seeds. Some water the seeds. But only God makes the seeds grow. Personal evangelism is very difficult for me. Even without approaching the subject of eternity, I struggle to approach people I don't know. I even feel awkward speaking to people I do know. I need to have a stronger love for the souls of others, and I need to have a greater desire to see God glorified. A problem in sharing the gospel is that I think too much about myself and not enough about the Lord. I have, from time to time, gathered the courage. Only the Lord knows if there have been any results. My approach has been by starting with what the Bible says about sin and the penalty of sin--sort of the Kirk Cameron approach, but not as direct. I share Spurgeon's belief that the fallow ground has to be plowed before it is ready for the seeds of the gospel. At any rate, I hope to become more confident in evangelism. I am convinced that it is our duty though I’ve failed to do it. Thanks for the comments, John and Ben. I think one of our greatest challenges in evangelism is learning how to do it relationally. So much evangelism training employs sales techniques. But this turns people off. We need to develop better relational skills, then pursue authentic relationships with unbelievers. When those relationships are strong, discussions about the gospel and spiritual things will be more natural. I am pathetic when it comes to what I term "cold calling" evangelism, that is, starting a discussion out of the blue when talking to strangers or even acquaintances about the gospel. However, I am quite bold in presenting the gospel to the adults and children at church or with family. I am also quite at ease in defending the gospel at my front door to JW's & Mormons, who frequent our neighborhood. I believe I am prepared to give a defense of the hope that is in me, as Scripture exhorts. But I am not prepared (or even comfortable) to present the gospel as part of a purposeful confrontational strategy to convert the world at large. Does that make sense?